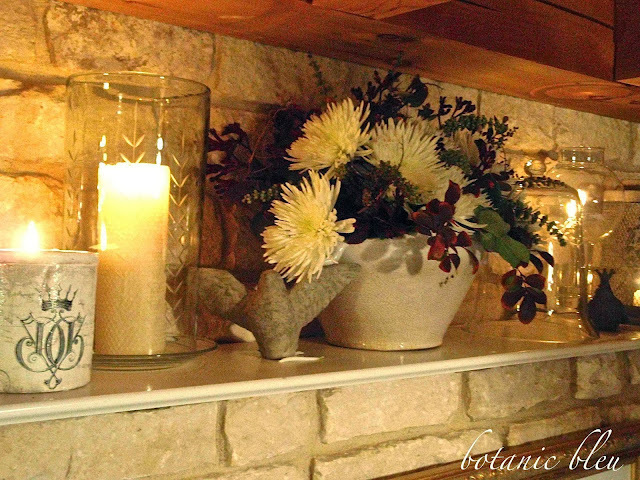 The Scoop on Creating Fall Vignettes. there are many more great ideas coming our way. hosted by these inspiring bloggers. Oh, yes, we are in for a special treat every month. with more great ideas just when we need them. just in time for ideas for Thanksgiving. 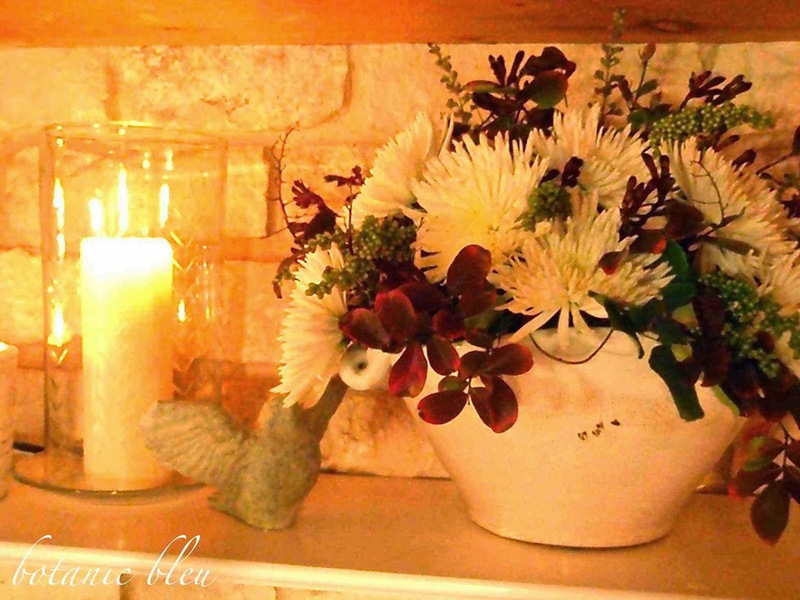 insider tips on HOW TO create their stunning vignettes. on their blogs and in magazines. I've learned several good tips. Each month there will be MORE great tips. 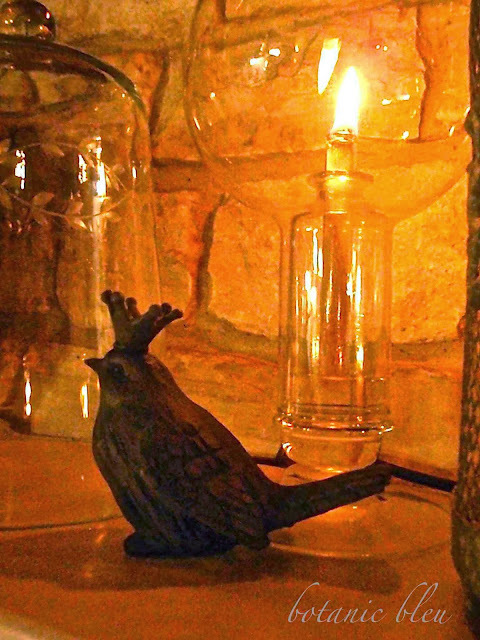 the warm glow of candlelights. 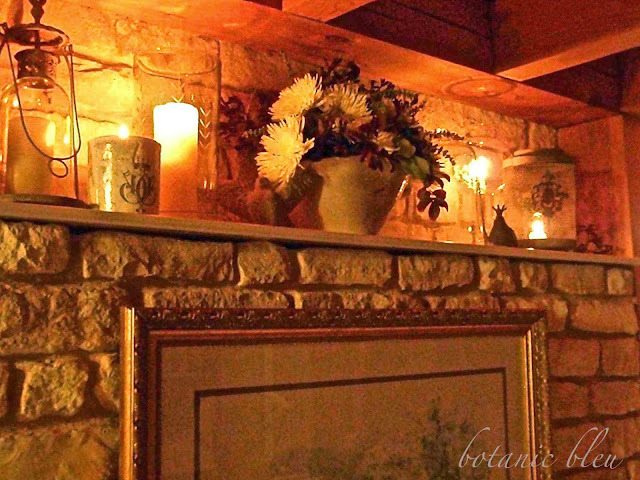 How did I create the ambience of warmth and light in this fall display? 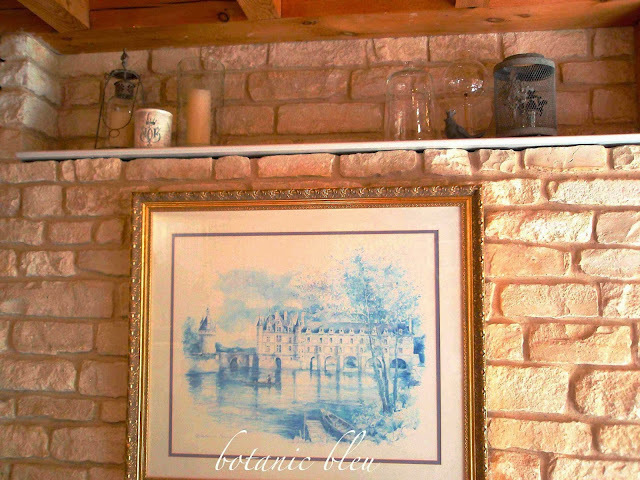 in the kitchen on the back of our white limestone fireplace. Here it is...empty and ready for a fall display. a kitchen shelf like this, and place only small displays on the table(s). with something that connects the items in the display. 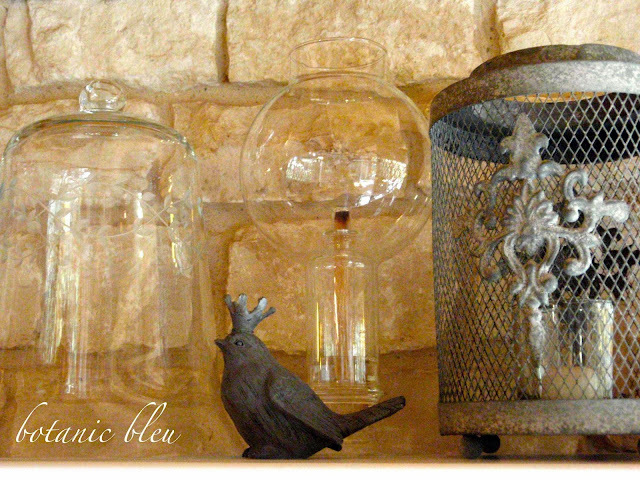 use objects that remind me of France. a beautiful castle in the French Loire Valley. to connect the display to the print. See Vignette Design Series #2 - Theme for more ideas on themes. which will be the focal point. Overall, there will be three visual groups. than even numbers of items. Really, marketing research bears this out. talented bloggers everywhere on this tour. an expression that is almost redundant. originally used to protect tender new plants in the garden. much more so than the flickering small candle to its right. that reminds me of French designs and patterns. 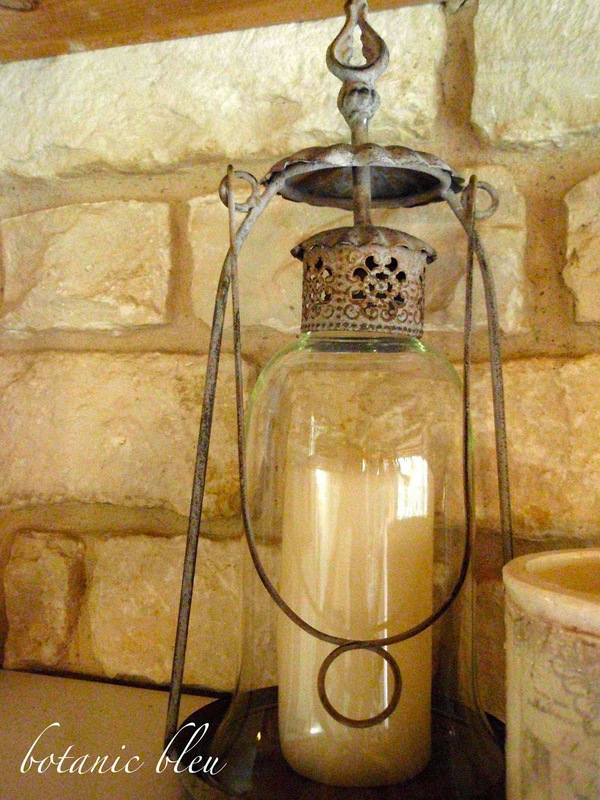 Plus the candle holder is grey meshed metal, very French looking. 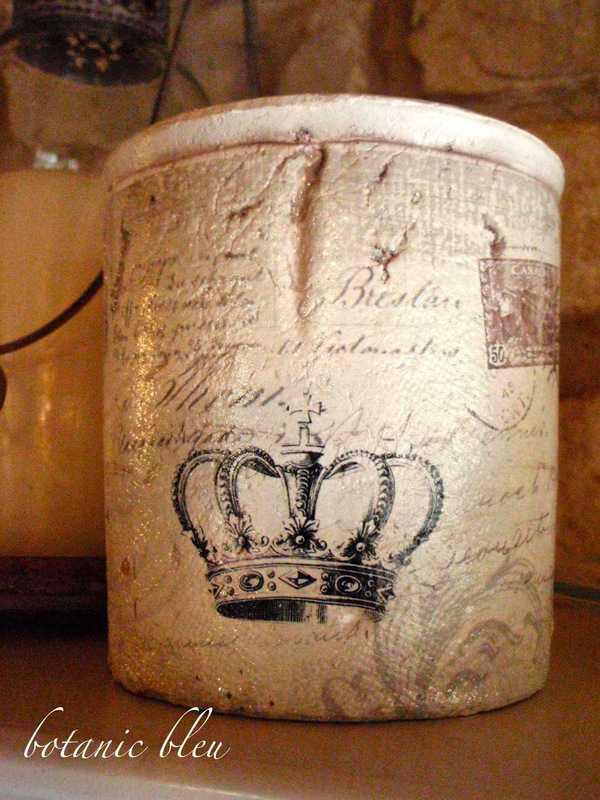 its crown is a symbol often used in French designs. a metal candle holder with a glass cover that echoes the cloche on the right. it balances the grey mesh candle holder on the right. A mix of both metal and glass are used on both sides of the shelf. are used on opposite sides of the shelf. rather just a visual balance of similar items. 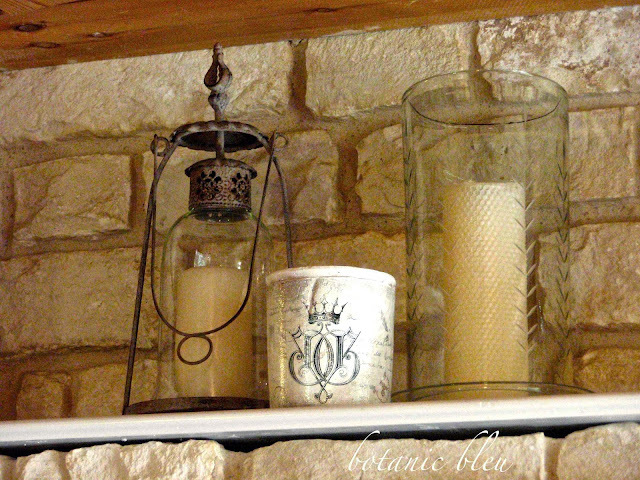 The short French script decorated candle holder is beautiful on both sides. of grey that also acts as a balancing factor. between the two taller ones and is slightly in front of the taller ones. brings the eyes down, then back up. about varying heights to create movement. that came from the local grocery store. Are there any flowers that define fall more than mums? which reinforces the flowers as the focal point. Height and central location draw the eyes to the flowers. to a setting, but the choice of flowers suggests the season. The flowers I chose help set the tone of fall. I said, "Don't use any cedar. I don't want it to look like Christmas." See what I mean about flowers suggest the season. 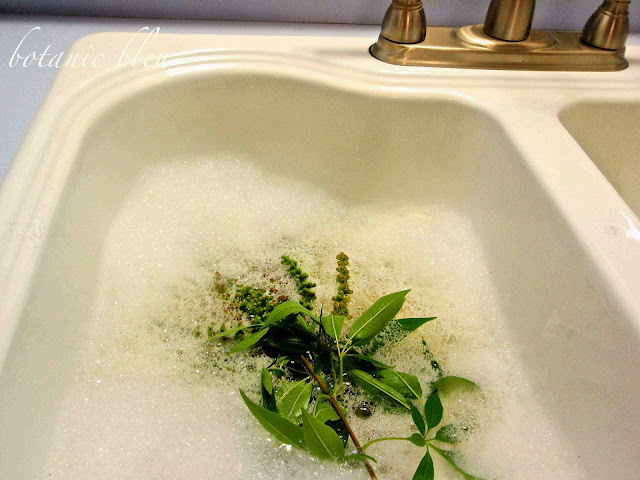 The foliage was free ... cut from my yard. 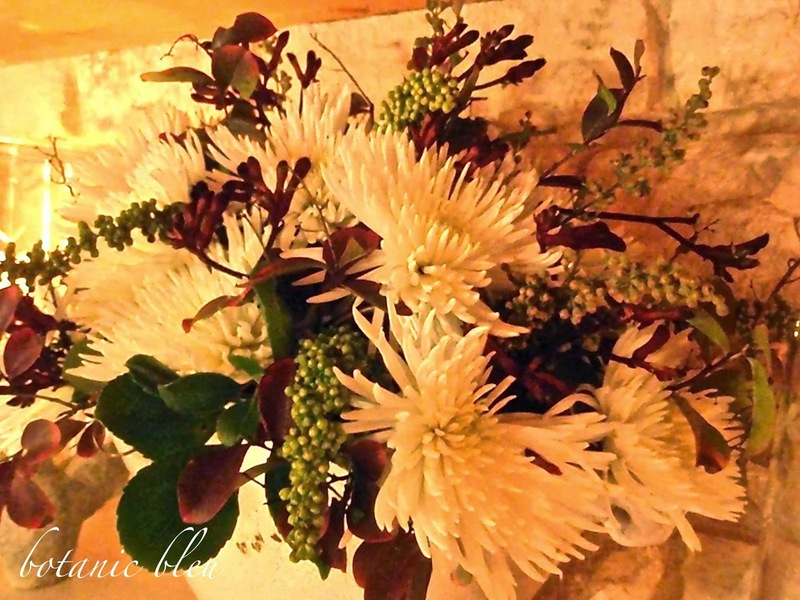 the feeling of fall in the arrangement. to go dormant for the upcoming winter. and to remove any insects hitching a ride. I use dish-washing liquid soap. Rinse under barely warm-to-cool water. so it will be pretty when seen from the sides. 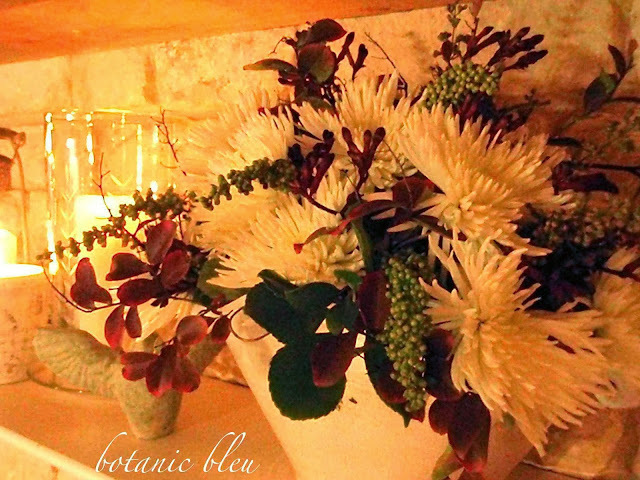 See French Flowers Today for more tips on arranging flowers. 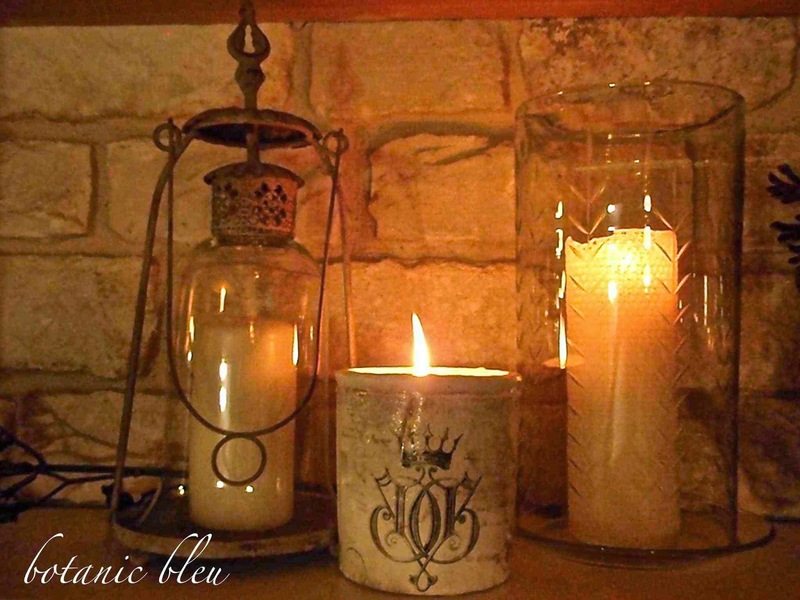 As the sunlight fades and evening shadows grow, light the candles for a warm glow. just as brilliant sunshine reflects summer. filled with lingering lights as the day prepares to sleep. and blur the sharp edges of life. to enjoy each other's company as the day draws to a close. what you see as shortcomings. That only draws attention to whatever you see as a flaw. Most people will not even notice what you see. Candlelight will help camouflage any less-than-perfect details. Enjoy any compliments, and graciously accept them with no apologies. filled with ambience from cloches, candles, lanterns, and flowers. May your fall be filled with a cozy soft glow. Just lovely, and great inspiration! Love the candlelight. This is beautiful! I love your tip on washing the clippings from outside...I clip most of my greenery from outside as well and I'll be washing it from now on :) Glad to have been on the tour with you! Oh the candlelight is so inviting! Truly lovely post! Glad to have 'met' you on tour…pinning & sharing! Beautiful ~ 2 of my favorite decor ideas... lanterns and cloches! How luvly. 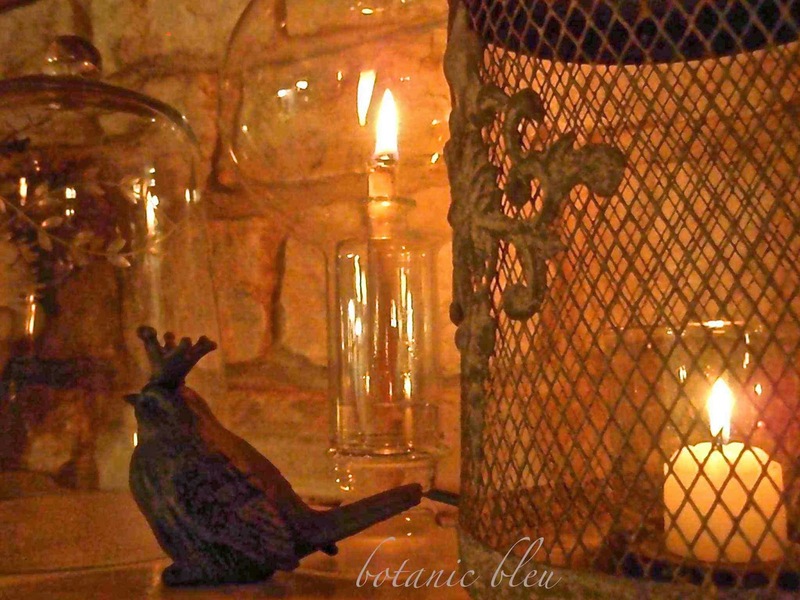 I am inspired by the candle light.. cloches and lanterns. 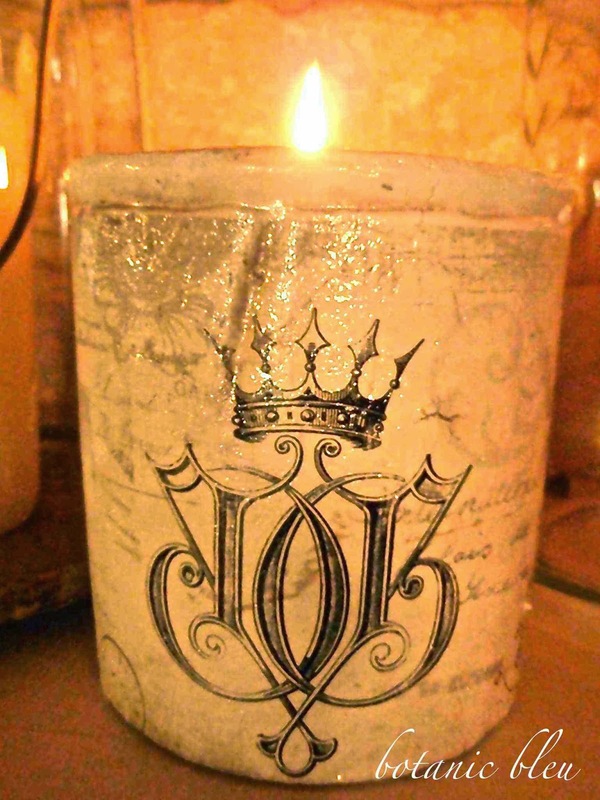 So pretty, glowing and warm-just perfect for Fall! Oh so pretty. 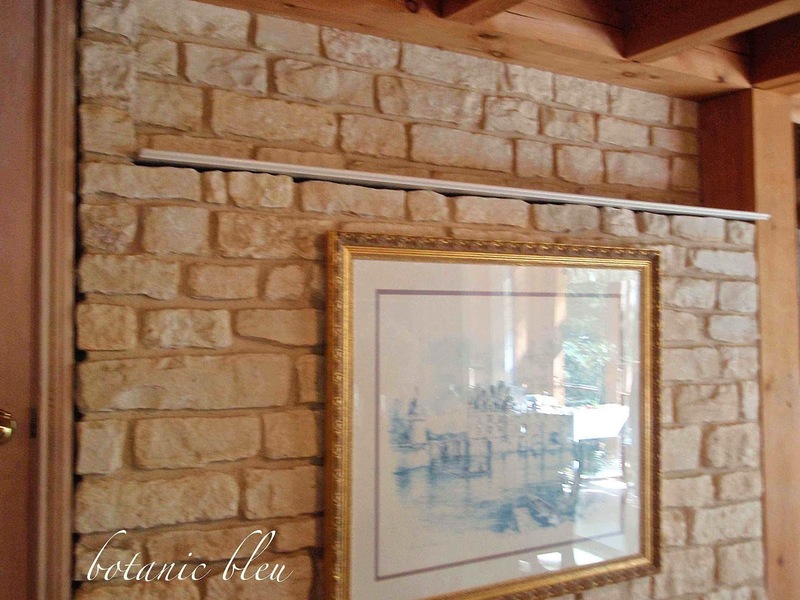 I love that stone on your fireplace. It looks so French to me and is a perfect backdrop for your vignette. 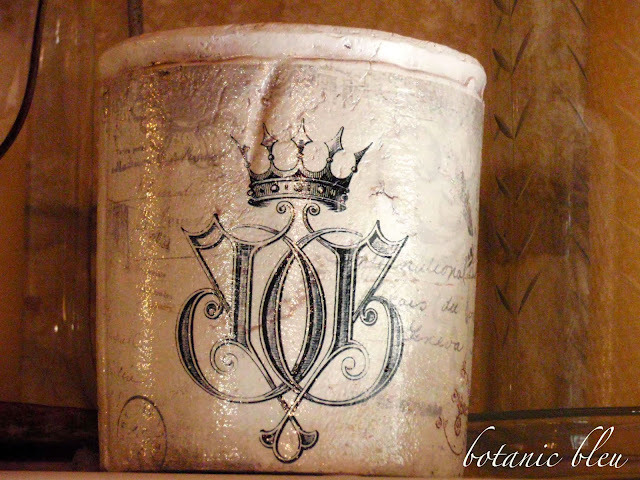 Love the French script candle holder!! Absolutely beautiful as your vignettes always are. It looks so warm and inviting, your guests will love basking in the candle glow. 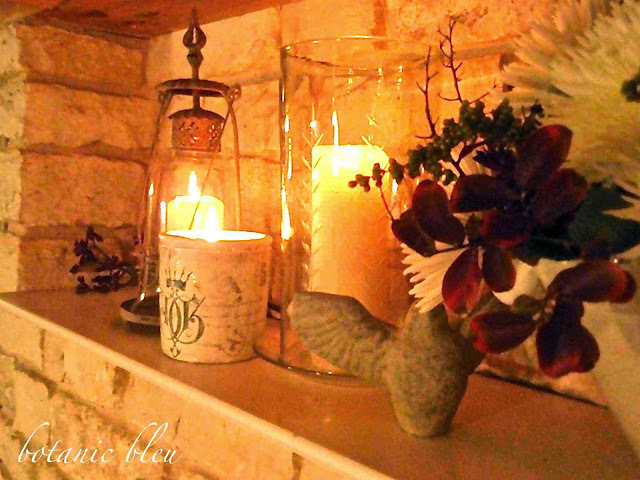 Love all that wonderful soft candlelight, just beautiful! !